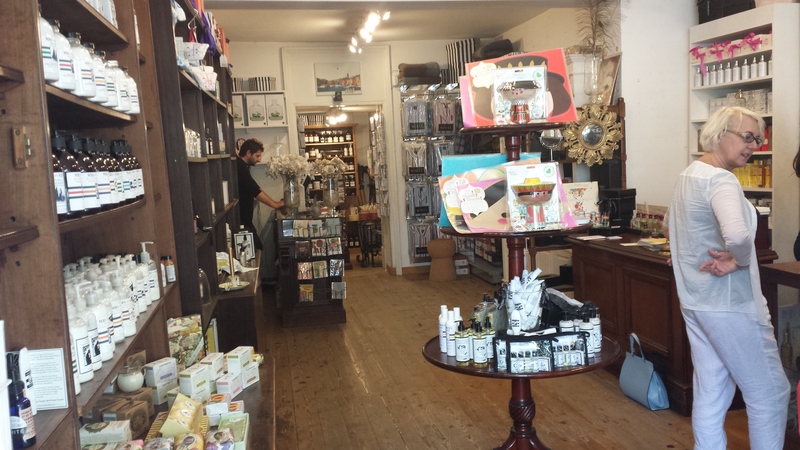 Recently I finally visited the perfumery at Roullier White in south east London for the first time. It took me so long because if you live north of the Thames, it’s not the most straight-forward place to get to. This is primarily because it’s not served by the underground network we are so used to travelling around the capital on. After taking two tube trains, I met fellow perfume lover Irum at London Bridge Station. From here we got the over-ground train to East Dulwich Station and then opposite we caught a bus (185, 40 or 176) to the North Cross Road stop on Lordship Lane. The shop is less than a minute’s walk at number 125. We were meeting our friends Nick of nickrgilbert.com and Sabine of Iridescents, who are both lucky to live locally. We found Nick and Sabine standing outside the front of the store enjoying ice-cream from the neighbouring Oddono’s Gelati. Not to be left out, Irum and I went off to indulge in exceptional blackberry sorbet and chocolate ice-cream (me) and salted caramel and pistachio ice-cream (Irum). Perfume people are nothing if not pleasure seekers. Having consumed our cones, we entered the store. 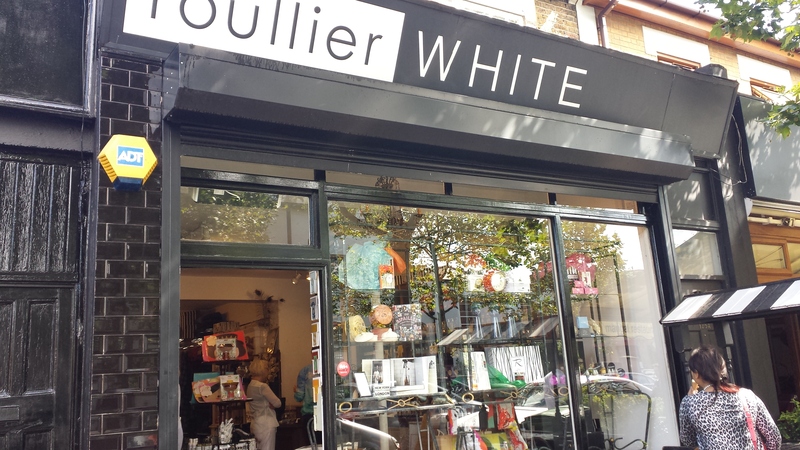 Roullier White is actually more than just a perfumery, it’s a life-style store. They stock everything from pet care and men’s accessories to scented candles and kitchen wares. There is also the Mrs White’s own brand range of home and beauty care products. After reading all this on their website I expected the shop to be pretty big but it’s actually just two rooms with a carefully edited selection of high quality products. Some of the perfumes are on the counters to the right, but they mainly line the shelves just behind them. The two sales assistants who helped us were knowledgeable and friendly. Straight away Irum and I asked to try the perfumes by Neela Vermeire Creations. These aren’t stocked anywhere else in London as far as I’m aware. I tried Ashoka for the first time, straight onto skin and liked it a lot. It is a beguiling beauty but the bright and bold personality of Bombay Bling! is still my favourite from this exquisite line which also includes Mohur and Trayee. 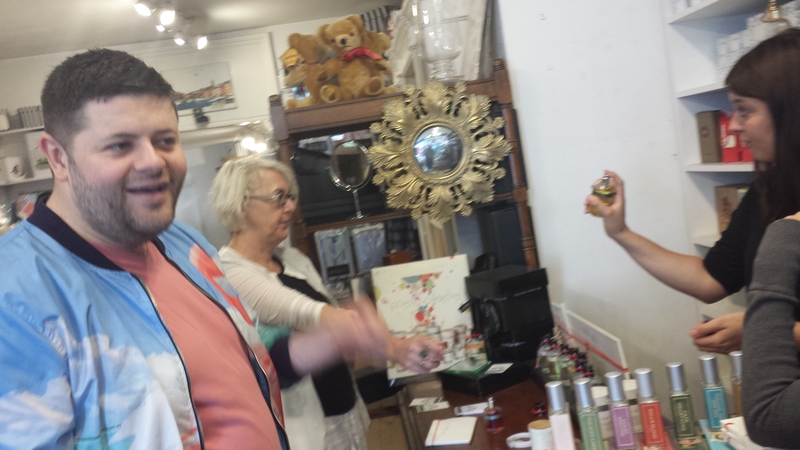 Sabine, Nick and I then had fun trying a few of the wacky Smell Bent fragrances, which are relatively cheap at £45 for 50ml. Tokyo Mama: Fizzzzz is so like the lemon flavoured fizzy drink 7Up that it made us laugh. Nick thought he may well buy a bottle next summer. Brussels Sprouted to my great relief was actually a green fig cologne and then there was Walk of Shame, which was not nearly shameful enough for Nick’s skanky tastes. However, after a fresh start on Sabine, it did start to reveal a little of the night before. Irum was looking for something for her boyfriend and very much liked Norne by Slumberhouse which she found wintry and Nick described as “labdanum-y forest floor”. Slumberhouse is an American boutique cologne label inspired by urban culture, particularly “the new school of hip hop”. Slumberhouse may be a bro’s brand but they have bottles with pretty beads in them. The hit of the day was Odd Fellows Bouquet by Atkinson’s which turned out to be a vanilla tobacco on skin. It was sweet on Nick to the point of resembling Spiriteuse Double Vanille, while to Irum’s slight disappointment it was a little drier on her. Atkinson’s is a British perfume house founded in 1799 and relaunched in September 2013 after a long absence. Prestigious customers of the past include the Duke of Wellington, Admiral Lord Nelson and Beau Brummell. We also tried fragrances from Histoires de Parfums, Carner Barcelona, Calé Fragranze d’Autore, Jardins D’Ecrivains and Imaginary Authors, among others. There was so much spritzing that it was hard to keep track as you can see from the photos. Do I spy a Flamingo jacket on Nick? Some of the other brands stocked are Mona di Orio, Jovoy, Mark Buxton Perfumes, Hiram Green, Aedes de Venustas, Caron, Olfactive Studio, Maria Lux, Farmacia SS. Annunziata, Maison des Reves, Rance, Evody and Maira Jung, but there were quite a few more to explore. I recommend going on the website and writing out a list of things to try before you go. After we were well and truly sniffed-out we retired to the House of Tippler next-door for gin cocktails and more chat, of a perfumed nature and otherwise. So whether you are based north or south of the river, it’s worth seeking out Roullier White for some brands you just can’t find anywhere else in the city and like us, why not enjoy some top quality ice-cream and cocktails at the same time? This entry was posted in By Tara, Shopping and tagged Fragrance, London, Perfume, Roullier White. Bookmark the permalink. Hi Tara. The perfumery sounds beautiful. Thank you for sharing the pics about the meeting and the perfume shop. Thanks for reading, Sandra. Glad you liked the pics. This looks like a really nice place for a visit. And I really like their selection of brands. Sorry Ines, it’s too early – please see below for my reply. It is well worth a visit and I agree, the selection of brands is really wide and varied. Thanks, Irum. Lovely to see you as ever. Now we know how to get there! Great to hear about your visit and what you got up to on the sniffing front. Brussels Sprouted and Walk of Shame are just too funny for words! Am not surprised you liked Oddfellow’s Bouquet – I fell for it at a perfumery in Lichfield, then re-smelt it during a visit with Sabine to RW in July, which only served to confirm my lemming. Sadly I was afflcted with a headache that day, so my own sampling of RW’s extensive range was severely curtailed. Also love the sound of your ice creams and gin cocktails – a feast for the senses all round! I think you’d get a kick out of the Smell Bent line. How about Tipsy Social Blah Blah? Too bad you had a headache when you visited. Maybe we can go back together sometime. Oddfellow’s Bouquet is great. Tara, my niece recently moved to London, so I’m sending this on to her, lucky girl that she is. Oh great. Hope she’s very happy here. If she loves perfume she must check out Les Senteurs and Bloom too. Isn’t Irum coming to Tokyo soon? Tell her to get in touch! I shall ask Irum about Tokyo. Lucky her. Not long till Thomas and NIgel’s honeymoon now. I know, dear M. It’s great but can’t help wishing it were closer/easier to get to! Sounds great though I’m not sure I’ll ever have a chance to visit it: there are just too many other great destinations while in London. But who knows, right? Exactly, who knows? If you ever want to go, I’m at the ready! I’ve always wanted to go to Roullier White, but as you say it’s a bit out of the way. Now you’ve taken us all there, so thank you Tara :D. I’m so happy that the Smell Bent and Neela Vermeire lines have found a home in the UK. Both are awesome! Well, now I know the way we can always go together if you ever want to. It is great that NVC is there and thanks for recommending Smell Bent. They were a lot of fun! I agree, I much prefer the tube. On the way home the bus broke down so it was even longer! Worth an occasional visit though. What did you think of Jardins D’Ecrivains? The views I’ve read seem to be quite divided. It was a fun day out. I’m afraid I didn’t get round to Jardins D’Ecrivains so I’m no help there. It was a bit overwhelming with so much on offer. I visited last year for the first time. What impressed me – is that after visiting all the niche boutiques in Paris, Amsterdam and Milan, I found stuff at Roullier White that I had not seen before – like the lovely Florascent Kokiku and the delicious (and affordable) Maison Aux Reves line. The SA (from NYC of all places) was incredibly knowledgeable. Highly recommended. Yes, considering perfume is only part of what is on offer at the store it is amazing how many unusual brands they stock which you can’t find elsewhere. It really makes a visit worthwhile and yes, the staff are great.